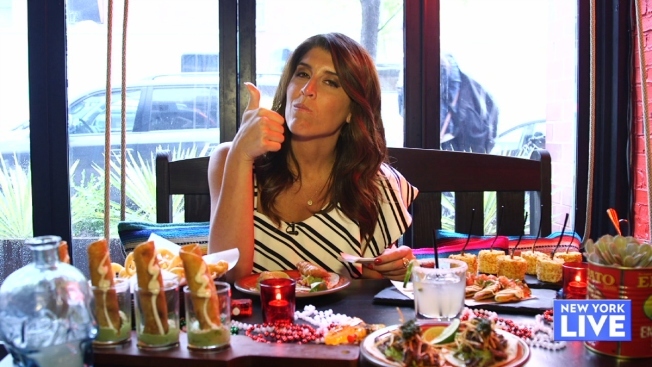 Lauren Scala reveals where the fiestas will be this year for Cinco De Mayo. Raise a margarita in honor of Cinco de Mayo! The annual holiday celebrates the Mexican Army's victory over the French in 1862, but is often celebrated with enticing drink and food deals. Camacho's, 118 E. 15 St., is giving away free shots every hour on Cinco de Mayo in addition to the free shots they give out at 11 p.m. nightly. Davio’s, 447 Lexington Ave., is throwing its first-ever Cinco de Mayo Rooftop Fiesta on its 27th floor terrace. El Vez, 259 Vesey St., is serving up $9 frozen classic margaritas, pork belly nachos and hamachi ceviche for Cinco de Mayo, in addition to other specials. A live mariachi band will also be playing from 6-10 p.m.
Guac Tacos + Tequila, 179 Avenue B, invites guests to buy four tacos and get the fifth free. They'll also be serving up $5 original and spicy margaritas, $5 Mexican beers, a guacamole flight for $25 and a free large guacamole with an order of five shots. Hudson Terrace, 621 W. 46 St., is offering free entry to their Cinco de Mayo celebration for guests who say “fiesta” at the door. Guests who arrive before 6:30 p.m. also get a free drink. Specials include two-for-one margaritas, $5 Bud Light & Modelo beers, $8 mango margaritas, $8 tequila shots and $10 cocktails. NYLO New York City hotel, 2178 Broadway, is celebrating the holiday in a different way with a Frida Kahlo-inspired cocktail. The Instagram-worthy drink will come in a sugar skull glass and a flower crown for $15. The party is from 5 p.m. until midnight. Treadwell Park, 1125 First Ave., is an Upper East Side bar offering a special of two house-smoked pulled pork tacos, a 21st Amendment El Sully Lager and a shot of tequila for $20. Haven Rooftop, 132 West 47 St., is hosting a fiesta with $5 tequila shots and $5 Mexican beers. There will also be food specials on tacos, nachos, ceviche, quesadillas and chips & guacamole. The night's festivities will go from 4-11 p.m. and will include a live DJ. Mundo, 37-06 36 St., will be pouring up their festive signature margarita, the Pachamama. Visitors can jam to music and listen to candid stories of romance performed by Rafa Reyes. The performance starts at 9:30 p.m. in the the Paper Factory Hotel’s Rose Room. Cantina Rooftop, 605 West 48th St., will be offering specials on ceviche, guacamole and tacos. Diners can also expect drink specials. Ghost Donkey, 4 Bleecker St., is mixing up signature cocktails like the El Diablo Swizzle and the Paloma. They'll also be serving up delicious drinks from their new frozen drink machine. Guests will leave with party favors like the "Cinco Kit," which contains a mini bottle of tequila, mexican candies and some festive Cinco de Mayo items. La Fonda del Sol, 200 Park Ave., is offering an all day happy hour in honor of Cinco de Mayo. Happy hour includes $5 drafts, $6 sangrias and $7 margaritas. And if you're feeling hungry, diners can snag $2 tacos from 3-10:30 p.m. in the bar and lounge. There's also something for tequila connoisseurs. La Fonda del Solo is also hosting a tequila tasting with El Gran Jubileo on Friday. The $35 event starts at 6:30 p.m.